I’m not sure if I fell in love with Ireland over a slice of brown bread or a taste of Irish Coffee Meringue. But I know that Irish brown bread has been a mainstay for generations. How can anyone not want this loaf to replace the factory fluff that fills breadboxes in most homes? When home baking can be as simple as this recipe, I’ve never understood why the whole country hasn’t taken to it. Everyone’s crying for better food, purer food, healthier food, less fat, more fiber, a key to good health—and here’s the first step. No one seems to have time to slice bread anymore, but if once a week you spend ten minutes with this dough and give it 1 ½ hours from start to finish (most of this time doesn’t demand any hands-on attention) you’ll have three small, fat-free loaves to carry you through a week. A five-pound bag of flour at Whole Foods costs less than three dollars and will give you fifteen loaves. They’re pure, they’re good for you; they’ll change your life. Ireland has moved way beyond the boiled cabbage rap of the past. The farm-to-table movement is stronger in Ireland than almost anyplace else. Artisan bakers, cheese makers, abound. Farmers’ markets flourish from Dublin and Cork to Galway and Belfast. The overall quality of food available, even in out-of-the-way villages, makes the simplest cooking outstanding. It’s easily possible to cook and dine better in Ireland today than in France. We Americans can learn a lot from the emerald isle. When Peter came to my door the other day bearing fifty-pound bags of flour from a distributor in the city, I rejoiced. I could finally lay my hands on medium-grind whole-wheat flour ideal for yeast bread. Unfortunately this coarser grind is not commonly available in supermarkets. The finer grind will suffice with the addition of a little more liquid, but keep your eyes peeled for the baker’s dream flour as you shop. I wanted to tell Peter to check my blog for the Ballymaloe Brown Bread; when I found I hadn’t yet posted the item, I knew my next task. Well, here it is with hopes it brings you new views about bread, the will to bake and a longing to visit Ireland. This moist bread will keep well for three days. I usually bake small loaves and store a couple in the freezer. The bread needs to be thoroughly cool before slicing, and if it is sliced before freezing it’s easy to snap out a couple of slices and pop them in a toaster for an almost-fresh-from-the-oven flavor. This is an American adaptation of the famous Brown Yeast Bread prepared daily at the Ballymaloe House in Shanagarry, County Cork, Ireland. Dissolve molasses in warm water and sprinkle yeast over top. Set aside and allow yeast to dissolve in the water. Meanwhile, combine flour, salt and ginger in medium bowl; make a well in center. When yeast has dissolved, stir it into water and pour liquid into flour. Mix with your clean hand or a rubber spatula until all flour has moistened into damp dough. It should be the consistency of a thick muffin batter. Finely milled flour will ask for a little more water. Butter or grease 1 large loaf tin, two 3 1/2-by-7 1/2-inch tins, or three 6-by-3 1/2 -inch tins. After dough has risen, fold it down with your hand and scoop into tins. Smooth top with damp fingers; sprinkle with sesame seeds; cover with tea towel and set aside to rise. Preheat oven to 450°F. If dough half fills tin, it should rise until it comes to top edge. This second rising takes 20-30 minutes, depending on warmth of room. Bake loaves for 25-40 minutes, depending on their size, or until nicely browned. 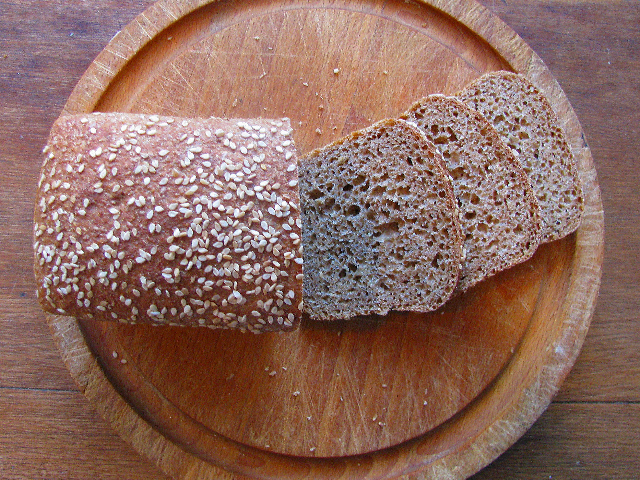 Remove loaves from tins at once (the loaf should sound hollow when knocked with a fist). Return loaves to oven without tins for further crisping if desired. Allow bread to cool on wire racks before slicing. This bread slices easily when fully cool, but it will be sticky inside if sliced while warm. He was a staunch potato eater. Occasionally a bowl of spaghetti appeared on the table, but when rice was mentioned, he raised his eyebrows and grumbled, “Rice is for Chine-eeez.” The rest of us slumped in our seats longing for the exotica of chow mein, chop suey and egg foo young alongside bowls of fluffy white stuff. The only exception to the forbidden grain came with rice pudding. Sometimes we saw squares of rice custard dusted with nutmeg, but the best ever was milky sweet rice that came to the kitchen table on Glenwood Avenue as a side dish along with fried venison steaks, Roman Meal bread and slow-cooked green beans with bacon. Once the holiday cookie tins are bare and we’re ready to accompany winter with hearty soups and stews for supper, there’s no better comfort than a cup of simple rice pudding for dessert. Rice pud’s perfect for a snow day when you need to make do with what’s on hand and still hope for an evening treat. Let’s count on milk and butter in the fridge, rice and sugar in the pantry and a vanilla bean or extract on the shelf. If there’s any chance for a rice selection, choose a round grain variety such as Japanese, Egyptian, Italian, Spanish, or any basic round rice. In a pinch use long grain if that’s all there is and the streets are snow-packed. Give the pudding time to simmer on a slow burner. Once it has thickened to a soft cream, spoon it into cups and garnish with a spoonful of homemade jam. Then wrap up in a blanket and return to Harry Potter. Rinse a heavy saucepan with water, add milk, salt, vanilla (add extract after cooking), cinnamon, lemon peel, rice and place covered over low heat. Simmer, stirring occasionally, for 30–40 minutes or until rice is tender. Add sugar, butter and simmer another 10–15 minutes or until nicely thickened. Remove cinnamon and lemon peels. 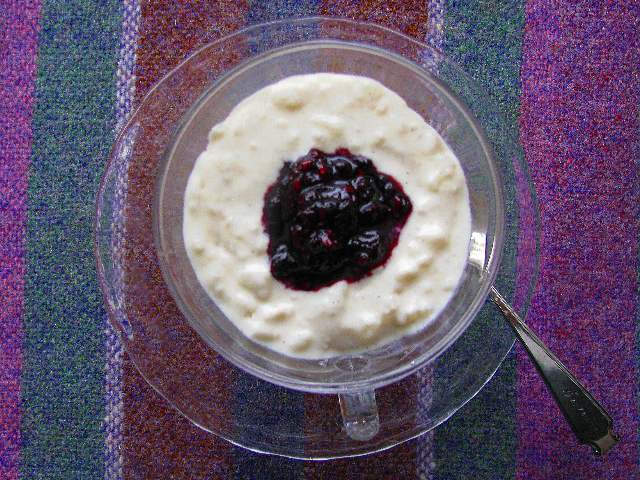 Serve warm with a spoonful of homemade jam or fresh cranberry sauce, or cool and add a generous spoonful of whipped cream for an imperial rice pudding. Serves 3 to 4. Combine over moderate heat until berries melt and sugar dissolves. Boil up quickly until thickened enough for jam. You are currently browsing the Mary Jo's Kitchen blog archives for January, 2012.